The Mayo Under 20s take the field at Croke Park on Sunday for their All-Ieland final meeting with Kildare, with throw-in set for 1.15pm. Michael Solan’s squad are underdogs but after their fearless and fervent performance in beating Derry in the semi-final they appear to be quietly confident of delivering another underage All-Ireland title for the county. In this final preview podcast, host Rob Murphy is joined by Mayo News sports editor Mike Finnerty to set the scene. Along the way we hear from Mayo News columnist Billy Joe Padden as well as Patrick Ward of the Kildare Post. Patrick O’Malley, who will line out in goals for Mayo on Sunday, also provides some pre-match thoughts, from the perspective of a player who also wore the No.1 jersey for Westrport in their 2017 Intermediate All-Ireland final success. This latest episode of the podcast is now online and is available to listen to on iTunes and SoundCloud. You can also listen to it on the Mayo News website or here on the blog using the SoundCloud player below or the one on the right. The Mayo News football podcast is brought to you with the support of the Sports Injuries and Sports Medicine Clinic in Castlebar. Theme music for the podcast is ‘Carrying the Fire’ by The Walls. The GAA’s treatment of this tournament is shameful. It’s clear they have no interest in it shoving the final in as a curtain raiser on the Sunday of a bank holiday. The match shoul have had its own billing last Saturday night in Longford. Also, there has been no marketing of the tournament either by the GAA.. no effort to promote it worth talking about. Either hold the tournament and treat it with respect….or don’t bother with it all. Great podcast lads.Mike giving a great insight into Mayo underage football for Supporters. Its great to hear what is happening in Westport 3 teams at every underage grade this is what is really needed if where to produce players good enough to land Sam. Some Rural club people might not agree with me but I think its important that the County board really help promote coaching and give funding in the big town clubs like Castlebar Mitchels, Ballina Stephenites, Westport, and Claremorris.If you look at them 4 clubs alone they have a population of 30,000 a quarter of the County. I think the more we can get out of these clubs the better for Mayo in the long run. Mike mentioned the Colleges too it is vital that coaching in Colmans, Geralds ,Rice College ,Muredachs, Ballinrobe and Nathys is of a high standard and they are all competing in the Connacht Colleges A championships. Own billing in Longford !! Capacity of about 6k since they reopened the stand that had been closed on safety grounds . 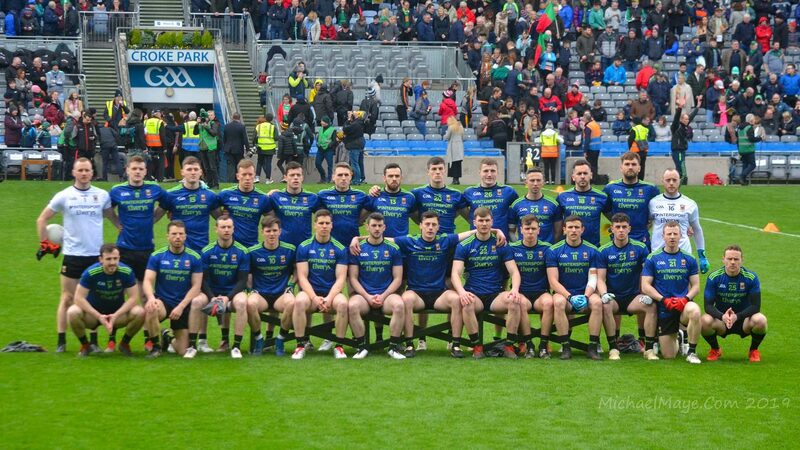 Think the player’s will be delighted to be going to Croke park .Really looking forward to seeing the match .No great demand from the Rossies so bagged 6 premium tickets so will be able to bring the kids as they have never been up there . Reckon there will be a decent crowd from both Kildare and Mayo . Playing the game in Longford would sure be a way of treating the final shamefully 🙂 Great that it’s in Croker and as the lads said on the pod, hopefully it’ll suit Mayo’s pacey players and style of play. Good info from Paddy Ward on the Kildare players on the podcast. @Spotlight i agree and its all because Paraic Duffy who has since stepped down from his role was for the best part of 10 years trying to get rid of the U21 grade. Its replacement tournament played without its best players and at the wrong time of the year is all wrong. The last U21 AI final Galway v Dublin was played in Tullamore and the first U20 final should have been played there also if common sense was used here. Michael, you would want to check your maths. If a lad is 25 in 2019 he was 22 in 2016 and so not an U21 in 2016. Most of the 2016 All Ireland winning U21’s will be 23 or 24 in 2019. There was a few of that squad who were U21 again in 2017. Sharoize Akram, Mattie Ruane, Brian Reape and James Carr are still 21 so I wouldn’t give up on them just yet. Pebblemaster realistically it’s going to be next year or never for most of that team and not it’s still early days for them. The most of them were not unde 21 in 2017, so that would mean those players if they don’t play in next years championship would be 25 in 2020. A lot of people had written off a number of players from the AI winning U21 team of 2006 around 2010/2011 as not good enough. Ger Caff, Boyler, Seamie, Barrett and Mickey Conroy among them. All those lads have given sterling service since and played in numerous AI senior finals getting us closer than ever. Far too early to be writing off the bulk of the U21s from 2016. What is undoubtedly great is that we’ve backed up that victory with another appearance in this years U20 final. You aren’t going to get all players through to senior from every underage team and a conveyor belt is needed to keep replenishing the ranks. The more work at underage, the more finals we get to at the various grades, the better the chances we have of building teams to be permanent serious AI senior contenders into the future. What about the welcome home parade etc? I presume an open top bus up main St Castlebar on Monday night with the cup. Then maybe on to Mchale Park or a civic reception or something. Has anything being planned or will they slip back quietly into the county under the cover of darkness? What about extra police officers and the traffic arrangements that will be needed for the night around the town to facilate the thousands who turn out to greet them and get a glimpse of the cup? Will plans for this only be thrown together at 15.30 on Sunday after we win? 3 men that would be worth chasing to fill Tony McEntees role as a Dublin based Selector would be Paul Curran Padraic Monaghan and John Divilly. Paul Curran who managed Ballymun Kickhams to a Dublin County Title and Clann Na Gael in Roscommon to a County title he is very highly rated. Padraic Monaghan a former Garrymore man based in Dublin has managed St Judes in the Dublin Senior championship a club that Kevin McManamon plays for.McManoman has said in an interview ha has the biggest influence on his football. lol @Corick Bridge keep dreaming mate. As if McGuinness would take a role as 2nd fiddle to Rochford! Just a note on the Homecoming Cekebration. At the risk of losing Aidan O ‘ Shea to the pop world, maybe someone could book him as Lead Vicalist to sing The River by GarthBrooks. Cillian and DOC will back him up. Here are some lines from the song not in strict sequence but it gives the flavour. And i will sail my vessel until the river runs dry. ‘Til the river runs dry. Please check Joe.ie Aidan O ‘Shea,Garth Brooks. The viideo was forwarded to Garth Brooks and says on his show that Aidan should make his living from singing. He was bowled over by the performance. I see ‘Michael Ryan’ the Tipperary hurling manager is not happy about Croke Park not being available for the Replay between Clare and Galway with so many being disappointed and not getting tickets for the Replay match.. Reckons that Ross v Dublin dead rubber could have been played on Saturday… In Dublin’s home venue for the super eight or is it their neutral venue eg Croke Park… It’s a shame from a Mayo and Kildare point of view…. After the U20 All Ireland final we could then relax and see a replay of a hugely anticipated hurling replay… I expect Mayo to win!.. Despite Kildare beating a very fancied Kerry.. I have to say that the particular Kerry team is not Kerry strongest U20’s.. Being deprived of the services of now Seniors and intelligible Clifford and Sean O Shea etc… So Mayo to win in the main event of the day, usually it will be played before a dead rubber! Mayo Abu! Which stand will have most of the Mayo supporters on Sunday? We should leave the “Mayo 4 Gareth” drive until after the U20s.? Have to agree with Chris would love to see Rochy bring in someone like Paul Curran for the role.If theres any man that knows how to bring down the Dubs its one of there own.He was an exceptional footballer in the 90s with Dublin won Footballer of the year in 1995 when Dublin won the All Ireland. As it stands, 10 teams are to lose a home league fixture because of breaking the team training camp’s instructions from Croke Park in the month of April.. The fixtures in question are to be played in a neutral venue… Does this mean that Dublin (who broke the rules going to France for training camp) will have to play in the ‘Neutral’ venue Croke Park, instead of normal home venue?… Come to think of it, don’t Dublin always give up their home venue Parnell Park and play all their matches in a ‘Neutral’ venue Croke Park? I see a few names being mentioned as helpers to Rochford, I actually met John Divilly here in Dublin after the youngsters training session, a clever guy and like myself believes that only a footballer can coach kids, he had success with UCD, beat Maurice Sheridans UCG this year in the Sigerson final and has won Sam himself, he knows how to win it. The above list know how its done, I know that there are a few exceptions, ie, Micky Harte. Of the 6 teams still left, Kevin Walsh and Galway is best placed to take on the Dubs. Any team news? Very interesting to see how Solan plans to cope with lively Kildare half forward line. And kildare brushed aside a fancied Dublin side before disposing of Kerry. Hopefully we have gone up a notch since the Derry match and strong subs at Solans disposal. Add to the list Eamonn Coleman Pete McGrath Sean Boylan Joe Kernan and Eugene McGee then half the managers never won an all Ireland as players. Galway will be found out next week whether its Dublin,Tyrone or Donegal. I think Dublin are on for the 5 in a row next year cause I see no one stopping them and I hope Mayo spoil the party like Offaly did in 1982. Rochford should bring in Sean Burke and Jim Flag on to his backroom team. Sean Burke would run the fook out of them and Jim Flag could knock off any owl rust that was still left on them. Does.anyone think that it’s a great owl fookin idea ? Brilliant Revellino And Bernard Flynn as team photographer, Brollix as motivational speaker Cormac Reilly to ref A v B games, Des Cahill as Nutritionist, Shane Curran for Strength and Conditioning and Mickey Harte as PRO. That would worry the dubs. The idea of planning a homecoming for the U20 team is the daftest I have heard in a long, long time. It is over 30 years since the Mayo Senior champions advertised a “victory dance” to take place after an upcoming Connacht Club game v the Leitrim champions. Despite several enquiries I never heard whether the dance was held as it would have lacked the “victory” element, the team having been well and truly trounced by the Leitrim men. Moral of the story: never count your chickens before they are hatched. Any old timers into hatching chickens will tell you of the mishaps which could happen. I have just checked the 2006 U21 winning team on the archive. Only two of the starting team did not go on to play a real and substantive part in Mayo Senior teams in subsequent years, Joe Dillon and Marcus Hannick. Also from that team to play his part for Mayo Seniors was sub Enda Varley. An exceptional performance for any U21 team. Has any other U21 team since 1960’s matched them? Chris Kelly, I 100% agree with you about the need to promote football in towns like Castlebar and Ballina. I presume that Westport is doing its own thing and three teams at every underage level is the minimum I would expect from these towns. I have often expressed that view here before and questioned what is going on in these towns without getting any response. County Board cannot do it on their own but can backup the clubs bigtime if they are making the effort. Again fundraising is a big factor and if fundraising is ring fenced for particular purpose it is easier to achieve rather than going into one big pot where its benefit is not seen. You could be the media mam revellino , with all that inane drivel ya spout you’d have the media driven up the wall. Don’t be worrying about me again like a good lad. Castlebar Mitchels in fairness are now doing it right with 4 County titles in recent years after a barren decade were the County town was stuck in Intermediate but with 12 thousand of a population they probably still should be producing more county players than they are.Paddy Durcan is there only starting 15 man with Mayo. Ballina Stephenites standards have dropped dramitically in the last 10 years in Senior and underage levels but they still produce alot of County players.David Clarke , Ger Caff , Evan Regan, Ciaran Treacy.Ballina town has a population of 10 thousand some of that shared with Ardnaree Sarsfields and Knockmore gaa clubs. Stephenites should probably be doing better at Senior level and getting back to were they were in the early 2000s when they were one of the tops clubs in the Country. Claremorris another town with a population of 5 thousand or so have produced such great talented underage teams in recent years but there Senior record is pretty poor they did reach a County Semi last year but were very dissapointing against the Ballintubber.They have also not produced any County players for Mayo in recent times. Brian Gallagher only one I can think off who was in and out with James Horan.Alot is expected of young James McCormack and Conor Diskin. Westport is finally producing after years of been a big Soccer town .A credit to all involved in Westport Gaa but they have to kick on at Senior level now and get up to Division 1 in the League playing more competetive games against the top clubs. Wouldn’t rule out the U21’s yet. Carr is the most highly rated but was unlucky this year with injury. Ruane only got into that U21 team late in that season for Val Roughneen but excelled when he got the chance. Has the kind of mobility needed for seniors. Irwin has the most natural talent of all, couldn’t cut it with seniors but think he made the last London team so all’s not lost there but maybe doesn’t have inter county pace. Thinking of Andy starting on bench next year and who can be a reliable out front ball winner in FF line,.. only 3 spring to mind pace wise, the Durcan bros and Akram. I know only one of those 3 is a natural corner forward JD and even he has been mentioned more as a half forward, however needs must. Regan and Loftus both need nearly another stone to win most of those 50 50’s and some coaching from Andy how the hell he keeps winning ball at 34. Reape putting up big scores in US… be interested how he plays in an underdog team in senior championship on his return. Every national league several big teams unveil a dangerous corner forward and we haven’t found one in ages. Every so often Kevin Mc gets asked to go inside and he wins every ball with his pace but as we all know he’s needed further out. Of the unused subs Conor OS has some pace and sometimes puts up big scores for his club. Boland has a great side step and vision but needs a stone extra for risking going into contact come championship.. also targeted by opposition kickouts in the past, again more a HF as is Loftus but one of them needs to become an effective ball winner. JD looks best bet as he’s the quick and won a good bit of ball on his debut season in championship. We will all be shouting for ye even my granddaughter from Limerick who is staying with us will be shouting for Mayo. She is a big Mayo fan . Great Podcast well done to one and all. Best wishes to Mike Solan his team and the Mayo boys in Croke Park on Sunday. A win would be great. Yes best wishes tell all involved with the U20s and let’s bring it home boys. Great team to watch and with strength in depth. May have to tighten things up at the back we were pretty loose at times against Derry. Expecting big games from our big men like Brian o Malley Jordan Flynn, Evan O Brien Nathan Moran Colm Diskin, The smaller faster men will do the damage McLaughlin Lambert O Donoghue. Not sure what the line up will be wouldn’t be surprise if Dawson came in To shore up defense. Off topic, but i notice that Limerick hurlers have now reached the 45 year mark in their owl famine. (Last Liam in 1973). We ourselves reached the 45 year mark in 1996. We got to the final that year too and we know how that ended. Limerick, just watch out for a sliotar bouncing over the owl crossbar in the last minute for a freak owl pint to deny ye victory. Having knocked out Kilkenny and Cork, ye deserve to end it now. (like we did in 96, having knocked out Kerry). Lads, if you think that prominent former Galway or Dublin players will be queuing up to coach Mayo underage sides, then I’ve got some magic beans to sell you. The answer is to re-invest in our youth structures, which suffered a little during our most recent assault on Sam Maguire. Ontheditch, there’s a load of articles on the u20 team in this week’s Mayo News. A full pull out section. Why don’t you invest in a copy. You can get it in Dublin too you know. @ Bohola. Looking for more neutral opinions in particular info on Kildare team. The Mayo News is available on Tuesday. No Mayo team or subs announced. Post team please if you have it. Poor old Sean B has a short fuse – only a bit of fun old stock. Must be worried about his Galway prediction coming up short. In more important matters, best of luck to M. Solans team and players in Sunday’s game. Looking forward to seeing the lads in action on Sunday afternoon. Fermanagh’s Niall Cullen will referee the meeting of Mayo and Kildare in the All-Ireland U20 final. But that’s it. Completely overshadowed by super 8 matches in national media. Even this blog, opened as an u 20 preview is almost totally distracted. Will if Paul Curran went to Clan Na Gael in Roscommon and was very interested in the managing Offaly last year I am sure he would he would be definetly be interested in getting involved with Mayo.He worked with Jim Gavin at Dublin Under 21 level and managed Ballymun to an All Ireland final losing to St Brigids and led Clann Na gael to there 1st County title in Roscommon for years. Out of Mayo itself Tom Prendergast, Maurice Sheridan, Enda Gilvarry, James Nallen, Pat Fallon, Declan Reilly, Peter Ford ,John Maughan and Shane Conway would all be likely candidates for Selector roles. They all have a great knowledge of Mayo Club football or Sigerson and Mayo underage football which is vital in selecting players to come in and make the difference to the Mayo bench which has cost us dearly in recent seasons. Peter Forde’s father was a Galway man, from Kinvara or thereabouts I think. He taught me in Ballinrobe CBS…. Anyways, Peter Forde does have that Galway connection. Liam O’Neill, another Galway man and, of course, Kevin’s father, was the first manager we had in the modern who set us on the course to become competitive at national level once again. Unchanged team for Sunday on twitter. It’s a pity Oisin Mullin isn’t fit to start. The Niall Cullen from Fermanagh who is referee for this game, is the linesman who Kevin Mc Stay recently hit on the head with the ball !!!! Believe it or not, he’s actually a native of Donegal, which begs the question as to why he was officiating at a Donegal match. Mm hit on the head by a mayoman. He did All Ireland IFC Final between Westport and St Colmcilles (Meath) in 2017, he was sound imo. Best of luck to the players named and to the rest of the panel who have all played their part. @Just a thought, is it 14 of those panellists you named are underage next year? With Rory Brickendon, Basil McLeod, John Gallagher, Cillian Golding and Oisin Mullins two years underage. Tommy Conroy, Nathan Moran and Evan OBrien underage next year. Is it only Sean Og Tighe, Matthew Macken, Conor Hunt, Michael McNieve, Justin Healy and Donovan Cosgrave overage from what you listed? With quite a fillup due to come in as u19s and possibly Adam Barrett given his rapid improvement. You could easily have just as good an u20 side next year, possibly better. To me the obvious person to bring in to to the Senior set up with Rochford is Solan our current u/20 manager, with his expertise and knowledge of the younger players would be invaluable. I know you are taking him away from a role that he has perfected and produced quality footballers playing the game the Mayo way, but I wonder could he perform a dual role managing the u/20s and be a selector with the Seniors, or at least have an advisory input. Rockford was very slow in introducing younger players and when he did he afforded them very little playing time. In any event lets hope that this talented group of players and manager get their just rewards.